Livermore discusses some of the successes and failures he has had in selling stocks for clients with large blocks. Due to his reputation in the newspapers as a skilled trader, he has received many such requests. In these chapters, Livermore goes into detail about which companies he sold under the requests of which stock owners. In some cases, he had luck on his side, as a prevailing bull market enabled him to employ the technique (of running up the price, and thus encouraging volume to grow) described in the previous chapter. But at other times, he simply advised his requester to sell, as he feared things would only get worse if he purchased more. In one particular instance, Livermore was double-crossed by a consortium he was in league with to drive up the price of a security. The large holders (who wanted to sell) were actually adding to their positions, as they figured Livermore would be driving the stock up in an attempt to attract speculators. Livermore, however, noticed the market action and did nothing of the sort. This left the large holders with even more stock to sell, and thus eventually caused the price to get driven even lower. Livermore notes that hogs are bound to lose. Often, a speculator will acquire a large block of stock that he wishes to sell. Unfortunately, unloading a ton of shares on the market will often reduce the selling price, and can sometimes even cause a panic. As such, selling large chunks of shares to the market is an art form that Livermore argues only specialists should perform. Livermore has been asked by large holders of stock to use his skill in selling their stock at a reasonable price. In return, Livermore asks for graduated call options on the stock, so that the higher he gets the price (resulting in a higher profit for the large holder), the more he gets paid. Unlike many stock manipulators of his day, Livermore sees no need to spread false rumours to get a stock price moving. Cognizant of the fact that humans tend to supply their own reasons for occurrences that are taking place, Livermore simply increases the volume of the stock in question by both buying and selling. He finds that the increase in volume attracts buyers, offering him the ability to sell into the newfound demand. 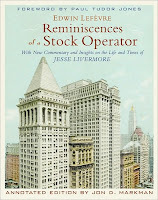 Livermore also discusses the exploits of some of the famous stock manipulators of years past. Some would try to corner markets, though that was no guarantee of success. Others would create ponzi schemes that the public would buy into without thought. As Livermore used to read about past stock market manipulations, he used to believe that people of yesteryear were simply not as bright as people today. With enough experience, however, he saw that people of his day are just as likely to fall for false promises of easy money as people of years past. Sterling Construction (STRL) builds and repairs roads, highways and water infrastructure for governments in Texas, Nevada and Utah. Sometimes, a stock will be down for reasons that are unknown. This is not the case here. Government budgets for infrastructure projects are weak, as states struggle with the lower tax receipts that the recession has brought. Competitors used to working on commercial and residential projects have entered the government market as a way to fill their excess capacity. Companies have been bidding for projects at extremely low, and sometimes negative margins! Amidst all this bad news, why would anyone in their right mind be interested in a company like Sterling Construction? Well, a look at the company's problems reveals that they are all of a short-term nature. This industry, along with many others, has more capacity than it has demand. When that happens, prices fall and margins get squeezed. But this doesn't last forever. As some competitors fail (due to high debt levels or money-losing operations) and industry capacity shrinks (as depreciation far outweighs capex), conditions will eventually return to normal. But margins and revenues will not return to normal overnight. Therefore, it is not enough for investors to find beaten down companies; they must ensure that these companies can last until such time as conditions are better. Sterling is such a company, with cash and short-term investments of $96 million against debt of $25 million. Furthermore, the company appears to trade at a discount to its earnings. Subtracting its net cash position, the company trades for just over $100 million, yet it earned $25 million in 2009! Earnings this year will be substantially lower than they were last year, however, due to the reasons discussed above. However, this company has the ability to maintain its capacity for when industry conditions return to normal. The market will beat down companies with poor near-term outlooks. Sterling Construction has proven to be no exception. However, as the company's problems are short-term, and as the company has the ability to outlast this downturn, investors with a long-term outlook may have here an opportunity for stellar returns with low risk. Smith-Midland Corporation (SMID) manufacturers and sells concrete products (e.g. highway safety barriers, exterior wall panels etc.) for the construction and other industries. The stock has spent a good part of the last year trading above $2/share, but despite weathering the recession fairly well, it now trades at $1.40. The company is not going to wow you with a steady earnings profile, as a couple of factors combine to make this a rather cyclical business. First, on the revenue side it relies on purchases from some industries that are rather cyclical. When the economy operates at overcapacity (as it does during a recession), construction projects get shelved. Second, the cost side of this business is rather fixed. In heavy manufacturing, certain amounts of fixed assets are needed to produce the finished goods, so cutting costs when revenue dries up is not an easy thing to do. But for investors who can stomach the volatile earnings, the stock appears to trade at a discount to its potential earnings. While the company trades for just $6.5 million, it has pulled in net income of over $3 million in just the last 3 years. The company also trades at a 33%+ discount to its book value. Of course, as discussed above, if the economy remains weak, it would not be surprising to see net losses occur, but that's why the company trades at such a low price point; for those who think long term, this could be an excellent entry point. One other point should be mentioned. This is one of the few Over-The-Counter (OTC) stocks discussed on this site. These stocks do not offer the same protections for investors as stocks traded on exchanges such as the NYSE or Nasdaq. Investors not familiar with these protections may wish to learn about them or stay away for now. When Livermore is wrong in his speculation, he has no problem with losing money as a result. When conditions change following a market bet he has made, he also has no problem losing money as a result. But Livermore does take exception to parties that weasel out of agreements. In one particular case, it cost Livermore millions of dollars. During World War I, coffee importers held too much supply, and thus sold the commodity to Livermore. Once transportation for the commodity began to return, Livermore stood to make a killing as the price would begin to rise. The importers, however, went to Washington and convinced regulators to force the immediate settlement of contracts so that they could profit over Livermore, a supposed speculator and profiteer that added no value to the economy. Livermore counters that it was he who stabilized the price when it was falling (to the benefit of the economy), and therefore it should be his reward if/when the situation turns. Livermore also tackles the uselessness of stock tips that are abound in the market. He claims to have received more than 100 tips per day! He never gave tips, for he recognized that in speculation, there is no sure thing. But the number of people willing to listen to and give away tips baffles him. Livermore recounts several stories where tips have led to disasters, and believes no speculator or investor should trade off them. One company president even gave a tip to Livermore's wife, and she traded on the info (only to lose her investment completely) unbeknownst to Livermore. Yesterday, GameStop (GME) shares fell more than 8% after the company missed expectations by a penny and guided earnings estimates lower for its 3rd quarter. A variety of factors appear to be coalescing in the short-term to push the stock close to its 52-week low. But longer term investors should actually be encouraged by the company's results, as the company appears set to generate years of strong free cash flow relative to its current market cap. First of all, a retailer like GameStop makes most of its money during the Christmas quarter, so a few cents here and there during the summer quarters says nothing about the health of the overall business. But still, how can one get excited by the company's long term outlook when short-term expectations are being lowered? Well, because of the reason for those lowered near-term expectations: namely, increased expenses associated with the national roll-out of initiatives that were very successful in their test locations. First, the company's loyalty program appears to have generated excellent returns in the test locations, causing management to want to take this program national immediately. Participation rates are high, and customers enrolled in the program have increased their transactions at GameStop, both as buyers and as used-game traders. The company is also going national this quarter with its in-store download kiosks. Customers appear to have taken to this new form of distribution, as 5% of the company's transactions now take place through these kiosks, which is up 80% year-over-year. But some skeptics no doubt wonder what good a couple of years of cash flow are worth, when the business model is out of date. Digital distribution is the way of the future; but the company is also focused on being the leader in this space. Its acquisitions show that the company will be a significant player when the market shifts from bricks-and-mortar to digital distribution. NPD reports that GameStop's online market share has grown 50% in the last year, and its online business was the fastest growing "dot com" in the gaming industry. In this quarter, the company plans to continue to improve its online offerings. It will add "buy online, pickup in-store" e-commerce capabilities, fully extend the royalty program (described above) to the web, and offer full-game downloads. GameStop will be well-positioned to handle the transition to digital distribution as it occurs over the next several years. In the meantime, the company appears to have a license to print cash. While the company trades for just $2.9 billion, it generates operating cash flow of over $600 million per year. It has a P/E (based on current year earnings estimates) of just 7, which doesn't take into account the fact that the company expects to finish the year with a cash position of $1 billion, representing one-third of the company's market cap! Furthermore, management has not been shy about returning cash to shareholders. The company has purchased $300 million worth of stock in the last few months, and hinted on yesterday's conference call that it is developing a plan to return more cash to shareholders in the form of annual buybacks. "There have been several big-box competitors who have launched "used" business. And we measure the run rates and impacts of used sales of all the stores adjacent to them, and we simply have not seen an impact. Now, some of the big-box competitors have not really even begun yet. They've announced that they've started, but we haven't seen that. And then another of the big-box competitors began with a small amount of stores. We haven't seen any expansion there. So on the competitor side, we just don't see the impact yet in our stores, but of course we take them seriously, we watch them closely. Believe us, a lot of the traffic in those competitor stores are our guys testing the process etcetera. So we're all over that." "Blockbuster has closed a lot of stores, so has Hollywood. And that has given us real estate opportunities into centers that heretofore we could not get into because they had exclusives...[A]s they continue to close stores, again, it gives us opportunities, especially into highly dense urban areas. If you take like the LA area etcetera, for example, which is a very difficult real estate market, it gives us opportunities to get into centers that we've not gotten into." Is GameStop the next Blockbuster? Unlikely. But Blockbuster's former locations can help add to GameStop's profits. When a stock is beaten down over short-term earnings, or even over long-term fears (that humans are very poor at predicting successfully, yet are very confident about), investors are often offered excellent companies at great discounts to their intrinsic values. GameStop appears to be one such company. I often get asked if I see value in some banks at these price levels. Some value investors purport to be able to value banks. Some may actually be able to, while others may only think they are able to. For the average retail investor, however, it is just too difficult to determine the intrinsic values of these "black boxes", for several reasons. Though many banks have been offering high dividend yields of late, it's extremely important to understand where that dividend is coming from in order to attain reasonable assurance that it is sustainable. Buying blindly for dividend yield is not an option. The dividend cuts that have taken place throughout this downturn have proven how susceptible this strategy is to an erosion of principal. Are there circumstances under which I would buy banks? Certainly. Under a situation where the entire industry is undervalued for example, a purchase of a basket of several banks helps diversify away the risk of failures here and there. This is a similar situation to our approach on pharmaceuticals, where large amounts of research money are being spent, but it's unclear which companies will reap the rewards. Tikcro Technologies (TIKRF) trades for just $7 million, but it has $7.4 million of cash on hand against just $240K of total liabilities. In addition, Tikcro owns between 20% and 30% of a public company in Israel named Biocancell (BICL). Tikcro's stake in Biocancell is worth about $8 million. One way of looking at the above situation is as follows: upon purchasing a share of TIKRF, the investor is getting the rights to an amount of cash equal to his investment, and in addition he is receiving a stake in another public company for absolutely free. For the value investor, a free stake in a business comes at just the right price, as it offers good downside protection. Unfortunately, this investment is not without risks. Second, it is not clear what Tikcro management will do with the company's cash, as no definite plans have been offered. Should that cash be invested in another risky business, the investor's margin of safety is gone just like that. Finally, this stock does not trade on a regular exchange. As such, it does not have the safeguards (which would be costly for a company of this size) that are offered to investors of companies on exchanges such as the Nasdaq or NYSE. Despite these risks, some value investors might find this to be an offer too tempting to resist. For now, downside protection is present (e.g. even if the Biocancell business goes bust, the cash still protects the shareholder's entire investment). Should the drugs under study work safely, however, shareholders will be rewarded many times over. Value investors try to outperform the market in the long-term by taking advantage of the market's endless focus on the short-term. For whatever reason, institutional investors and stock market analysts appear to focus solely on the next quarter, instead of the next several years ("long-term" for them means thinking as far as the quarter after next). 1) Will the pricing that was set in June change during this quarter, or stay the same? 2) What will demand and pricing be through the fall? What are the key items that will impact the September and December gross margins? Can you take out any costs immediately to improve the gross margin in the September quarter? 3) Did European customers continue buying into start of the September quarter? 4) What's the inventory situation with respect to back-to-school demand? 5) Might some holiday inventory build get pulled into the fall? 6) What does industry capacity look like relative to demand for the next two quarters? 7) How much restocking did customers do in the March quarter? As a result, I wonder if there are particular attributes of this company which encourage or result in short-term thinking. Are there particular industries or companies which lend themselves to short-term thinking, for whatever reason? What are those reasons? Feel free to comment if you have any thoughts on this issue. Livermore now shares some of his speculating techniques, many of which he has learned from other speculators. Livermore clearly believes speculation to not be the same as gambling. He believes his method of trading contains little to no elements of gambling, and therefore is safe. One of his abilities relative to other traders is that he is able to separate his opinions from his portfolio. Livermore claims a great many investors are simply bulls because they own stocks, but what they own should not affect their outlook. Livermore buys when the market (or a security) is going up, and sells short when the market (or a security) is going down. If he believes a stock is going up, he will buy it, but not all at once. He first tests the water by placing an initial order. If the order is easily absorbed by the market or the price falls (or rises if he is short) despite the order, he will consider himself wrong for now and will get out. If the price rises on his buy, however, he believes there are more buyers than sellers out there and he will re-enter the market with a subsequent order. When one is unsure about the market's (or a security's) direction, Livermore advises placing test orders to determine how well the market absorbs an order. If the market is not absorbing well, there could be a big move and Livermore would enter with larger orders. Before Livermore learned to employ the above technique, however, he was wiped out once more. In 1907 he saw a bear market coming, but was too early in selling short three straight times. A bull market was on, and when it looked like it was ready to fizzle out, Livermore jumped in with large sell orders that he eventually had to buy back at higher prices. The last of these cleaned him out completely. Because he generated lots of commissions for his broker, they fronted him some more money, and Livermore was finally correct about his predicted bear market. He made back a ton of money in a huge market sell-off. Western Digital Corp (WDC) trades at a P/E of just 4.5, despite having cash of $2.7 billion against debt of just $400 million. Subtracting the net cash position from the company's market cap (as we have previously done with other companies) gives the company a P/E of under 3! It is rare to find a large cap trading at such a low P/E, particularly in a growth industry (the company sells hard drives, which more and more of the devices we use rely on). But before jumping in, investors should be aware of a couple of caveats. One may ask why the company is not busy buying back shares at these prices using its strong cash position. The first problem is that the $2.7 billion in cash is not freely distributable to company shareholders. The company earned this money through its international subsidiaries, and would be subject to a large tax payment (in excess of $1 billion) if it repatriated these funds. As a result, the company is incentivized to continually re-invest this money overseas, which could lead to poor allocation decisions and which can't be used to reward shareholders any time soon. This same issue also affects the company's earnings, which are abnormally high relative to the company's operating income. This is because the company is using a very low tax rate, thanks to tax holidays in some of its foreign jurisdictions. But some of these tax holidays will expire soon. Furthermore, if shareholders ever expect to get paid, repatriation taxes (which are not currently accounted for by the company) will have to be paid. Therefore, the currently low tax rate, which is contributing to the high earnings, may not be sustainable. Accounting for these tax issues raises the adjusted P/E of the company by a few points, but still leaves it looking grossly undervalued. Part of the reason is that the company is currently experiencing peak operating margins. The company has been better at cutting costs and being more productive than the competition, but as the competition catches up, margins for Western Digital should come down. Over the last 10 years, the company has averaged operating margins of under 8% of revenue, but this year the company pulled in margins of 15%. This has made this year's earnings high, but as competitors ramp up production, prices for hard drive units continue to fall, and in this somewhat commodity-like sector, Western Digital does not have a lot of control over pricing. Value investors prefer not to invest in companies that do not have a lot of control when it comes to pricing, and prefer to use average earnings over current earnings. Despite these warnings, Western Digital may still hold appeal for value investors, particularly if its price continues to fall. For a good discussion of WDC's competitive position, have a look at Tom Armistead's article here. Yesterday, shares of Blonder Tongue Labs (BDR) rose by 70%. You won't find stock returns of this magnitude in large-cap companies, which is why for truly exceptional returns, investors should look for value among the thousands of small and micro-cap companies that are for sale to the public. Many of these small, obscure companies trade at large discounts to their intrinsic values. Can these discounts be identified and exploited by value investors? Absolutely. Just four months ago, BDR was identified on this site as a potential value investment, and has been sitting on the Stock Ideas page ever since. Today, its price is more than 100% higher. Sales of BDR's newest digital product have taken off, resulting in large 2010 Q2 profits which were announced yesterday. But investors did not have to see the success of this new product coming; for the last year, the company has been trading at a massive discount to its net current assets and its land under ownership. The patient value investor had protected his capital from downside erosion (the first rule of value investing) and had left himself plenty of room for upside should the outlook for this company change. Sometimes, investor outlooks for companies don't change for years. In other cases, the outlook can change in a hurry. If the value investor concentrates on protecting the downside and leaving plenty of room for upside potential, he should do well in either case. About eight months ago, Imation (IMN) was discussed on this site as a potential stock idea. It traded for $300 million and had $80 million worth of cash (with no debt). Today, Imation trades a little higher at $360 million, but now has $250 million worth of cash. The company has been breaking even on an earnings basis, but is getting positive cash flow from cutting its inventory/receivables and from cash earnings (since cash is not affected by Goodwill write-downs and amortization). Many companies need to carry large cash balances (e.g. for capital outlays), but Imation is not one of those companies. Depreciation expenses have been almost twice as much as capital expenditures over the last several years, and the company settled a lawsuit a couple of quarters ago that reduced its cash obligations significantly. As such much of that money, which represents about 70% of the company's market cap, could be returned to shareholders without harming the business. But will that money be distributed? "We've recognized that the cash on our balance sheet is not getting the return our shareholders want. And we've looked at other strategies, including bulk share repurchase and dividends. That's not promising what we're going to do or when we're going to do it, except that we understand, we get the math, we understand that you don't want a lot of cash just sitting on the balance sheet and not deployed." We've seen before the kind of price run-up that can occur when management returns cash to shareholders. Not only does the stock price often benefit because of the immediate cash distribution, but it also begins to trade up on the idea that management is shareholder-friendly and will therefore operate in a shareholder-friendly way in the future as well. On the other hand, nothing is guaranteed here, as Imation is also free to pursue acquisitions with the bulk of its cash as well. But at the current share price, hopefully shareholders will benefit no matter how that cash is deployed.